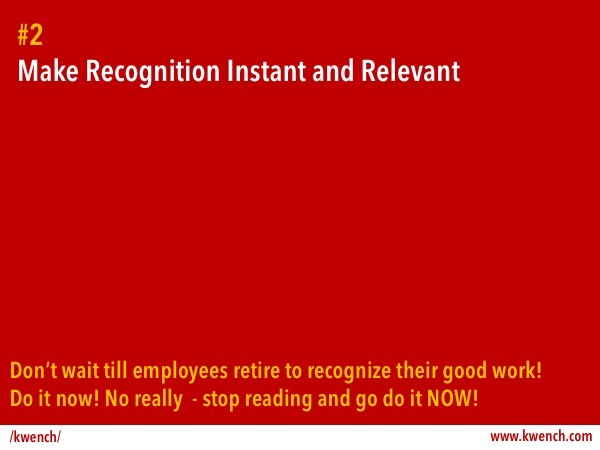 Employee Recognition is essential. Everybody gets that part. 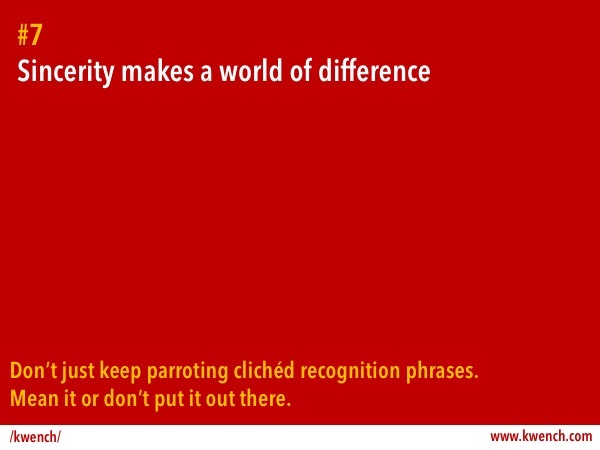 What goes into making recognition effective, however, is mostly guesswork. 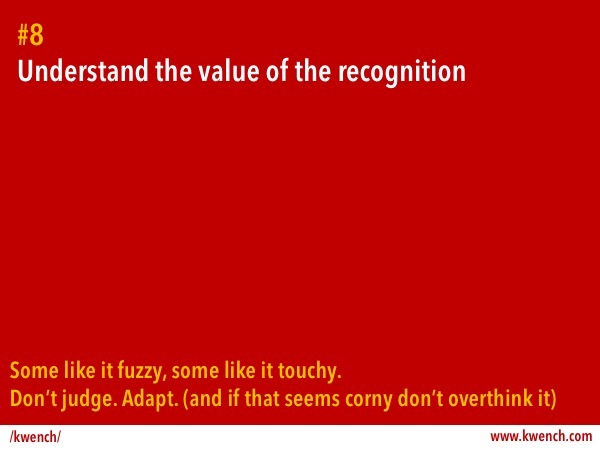 And that is not all bad – because there is no template for doing recognition right. What works for a young e-commerce start-up with 20 somethings hacking away day and night might not make sense for an SMB in the technology space and definitely won’t make sense for a large manufacturing conglomerate. So yes, recognition is unique to the company, its work culture, its dynamics, and its value systems. But having said that, there are a few core aspects that one might consider while designing the Rewards and Recognition program, which would go a long way in making recognition more effective and help in building a culture of recognition at the workplace. 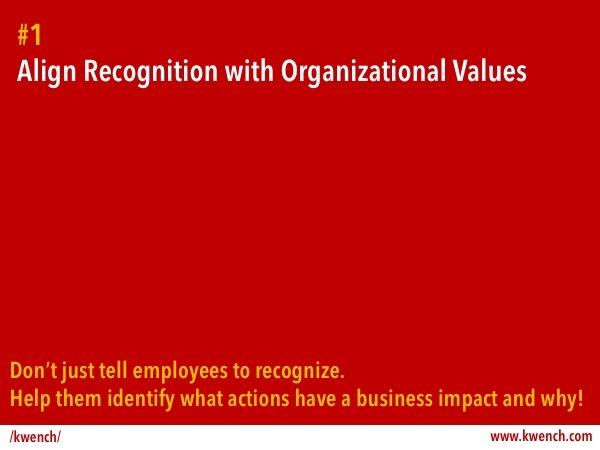 When employees know how their actions are impacting the overall organizational goals and when the recognition reinforces the alignment with value systems it helps drive desirable behavior. In today’s hyper-networked world where news, rumors, and memes spread like wildfire, it seems ridiculous that one would have to wait for a monthly town hall (if not a longer duration) to receive recognition for an achievement. Recognition is more impactful when it is given soon after the action or achievement of the team member you wish to praise. 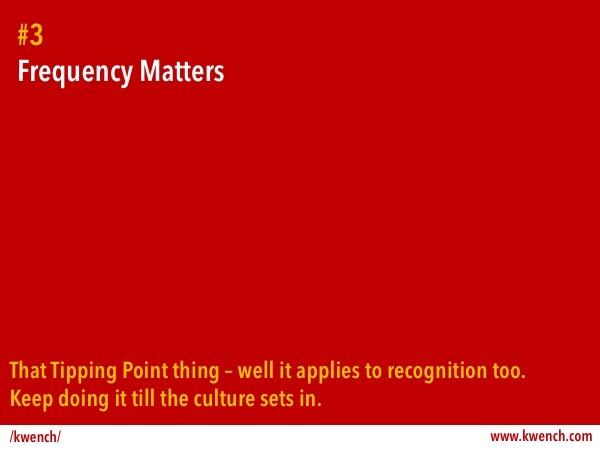 The frequency of recognition, especially when married with point #1, has a big impact on shaping behavior in the workplace. 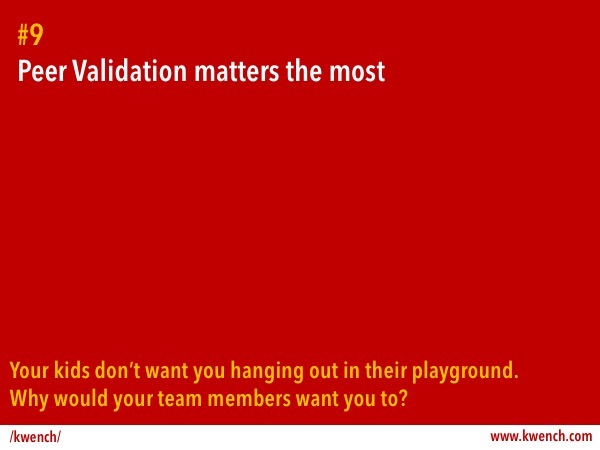 This is one of the most crucial aspects to be considered when designing Rewards and Recognition programs. In most organizations, there is an established program around events – Annual Days, Founding Day, Monthly Town-halls when great work is recognized. And then there are the rewards around specific events like “Safety Week”, “Health Awareness Week” and so on. Establishing a culture of recognition entails going beyond the limited opportunities offered by “events” to incorporating recognition as a part of daily work practices. When people managers (and peers) are empowered and encouraged to recognize good work, the concept of recognition gets instilled in the organizational culture. A lot of the awards that are currently included in organizational rewards and recognition program don’t focus on building connections. Employee of the Month/Quarter/Year has to be an award that does the most to divide rather than unite the employees. On some criterion (mostly subjective), people managers choose one person out a team and declare her to be the best among the lot. Not a lot going for engagement there! 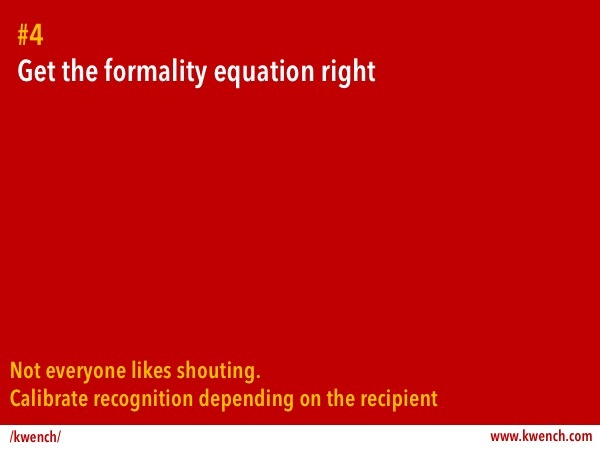 Consider other formal awards like Long Service Awards celebrate just people for “being there” rather than performance. In the new world of work that doesn’t offer job security and requires constant reinvention, this is the equivalent of using a cuckoo-clock to tell you the time. Looks good, but not very practical. On the other hand, personal one-one recognition helps to establish a connection between the giver and the receiver. 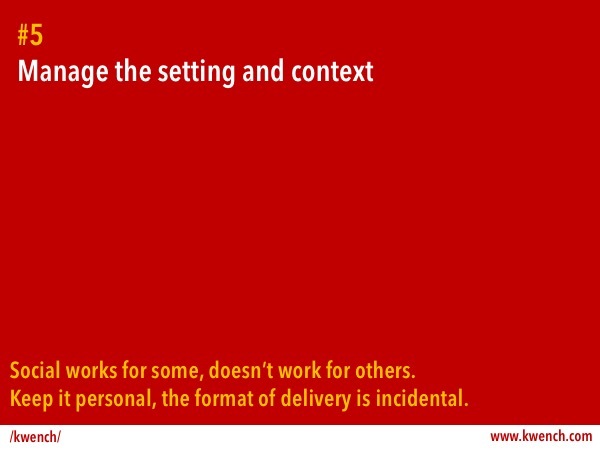 When others can participate in the conversation (it’s all social these days) it adds to impact. So don’t go social blindly. Choose between a quiet note of appreciation left on the keyboard versus an announcement on your favorite social platform, depending on the personality of the recipient. But yes, one thing is common to all types – they like recognition to be personal, not boiler-plate. In organizations getting an appreciation from senior management is often seen as an achievement in itself – especially in the more staid, formal setups. But here is the thing – you can’t fool the recipient. If the recognition is of a public nature, and broad-strokes, big-picture “you saved the company by fixing that big issue” type recognition then the higher up the ladder it comes from more the engagement. But if it is something that delves into the nuances of say assembly level code fix that changes the way the graphics accelerator chip renders 3D images a recognition by the reclusive senior architect might resonate far higher than one from the President of Sales. 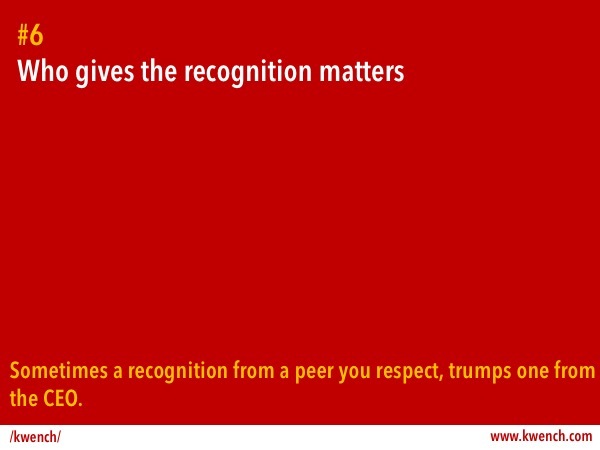 In fact, when it comes to personal recognition it seems Peer Recognition rates over Supervisor/Management recognition. “Annie, Great job on that account”, “Richa, Great job on account Y”, “Vikram, Great job with our oldest account”, “Gita…” you get the picture. There are people managers of every hue. At one extreme are the ones who don’t see any value in recognizing, and at the other are the ones who jump in with boilerplate “Great Job” to all and sundry (or worse – are biased towards a certain set of team members). The value of the recognition you give is correlated to the sincerity with which you give it (and it is very difficult to fake this). Scaling back on recognition is better than handing them out like candy. Appreciation and recognition by the superiors have always been valued, but as organizations become flatter, more competitive and roles become more amorphous and complex – peer validation of recognition has taken on a whole new level of importance. Your supervisor might feel that you have done a great job, but your peers really know how you did it! And when they show support for the recognition it is a true validation of the achievement. Technology today (did I mention ‘social’) lets everyone ‘participate in the discussion’ around individual recognition. Mass Mails followed by “Reply-all” spams have been replaced with social feed and likes/comments.